In the U.S., our national elections are less than 100 days away. For the next three months we’ll read and hear a lot of what some call “politalk” – political talk – in news stories, TV ads, speeches, and interviews. We’ve heard a lot of this before, but occasionally some words become part of the news. Here, for a little election year fun, are a few interesting and unusual political words that people have been talking about. Let me begin with a handful of (a few) ordinary, everyday political terms. A candidate is someone who wants to become a mayor, governor, member of Congress, president, or something else. Candidates belong to parties – groups of people with similar ideas about what to think and what to do. Candidates and parties campaign – say and do things to try to get people to vote for them. You can use campaign as a verb and a noun. “Dumpster fire” is a meme – a word, idea, fashion style, etc., that quickly spreads from person to person, often through the Internet. It appeared a few years ago in stories about sports and politics and has already been added to the Oxford English Dictionary. “Beyond the pale” is an old idiom. Many years ago, pale was used to refer to a wooden stake, or pole, used to hold up grape plants. It came to be used as a fence of pointed stakes and, from that, to refer to a boundary, a line that marks the edge of a state or country or an area of land that belongs to someone. The person who said the justice’s comments went “beyond the pale” meant that the comments went over, or beyond, the boundary of what was acceptable. In other word, a Supreme Court justice should not do something like that. A short time ago, a well-known American businessman got very angry with a candidate and called him a “jagoff,” but almost no one knew what he meant. Those who did probably live in or come from western Pennsylvania, especially around the city of Pittsburgh. It is local slang (informal language used by a small group of people) that describes a person who is stupid and inept (not good at doing anything) and it’s been used in that area for many years. No one is sure how it got started. Vice President Joe Biden recently polished off (made clean or shiny; prepared for use) one of his favorites descriptions and called a statement (something said) by one of the candidates “a bunch of malarky!” Malarky is a 100-year-old word that means lies (untruths) and exaggerations (statements that make something seem better, larger than it really is) or nonsense (statements that aren’t true or that seem very stupid). Our vice president is one of the few people who still use it. Are there any interesting or unusual words used during political campaigns where you live? Or have you seen or heard any other English political words that you’re curious about? A final note, a reminder: this blog post has been about political language, not politics. It’d be kind of cool if the comments were, too. ~ Warren Ediger – creator of the Successful English website: I help business and professional people improve their English and help students prepare to succeed in an English academic environment. Photo by Goat4421 used under Creative Commons license. This entry was posted in Language & Terms, News and Current Events. Bookmark the permalink. 6 Responses to Danger! 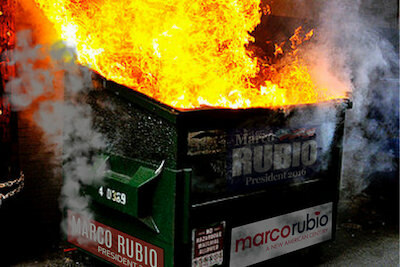 Dumpster Fire! Thanks for all those interesting new terms. As an outsider and follower of US’ political situation I am always hungry for those mysterious term that I often stumble upon reading online articles. As an example for a dumpster fire I was thinking at the DNC. They had a really bad start with the emails leak scandal. I also read about that justice that after apologized recognizing that her comments were inappropriate. I do make some inappropriate comments sometimes. The most important thing as you see is being conscious of that. When I think Biden I cannot help but thinking at that famous video where he is trying to kiss that poor girl that doesn’t want to..that’s funny. Biden is notoriously a hugger. He’s quite a character. Hey Warren you know what I dislike about American culture/politics? That the insult/term “racist” is thrown around so easily! Sometimes it seems as though anything is racist. That’s so frustrating. Thanks for sharing all these interesting information. Love theses blog posts. Hello, guys. Nothing to add. Thank you Warren for such words so full of content and new for me. They fit perfectly to any political show or you name it that you want to call it. Here in Spain, but they boil beans everywhere, we are suffering from the same stone in shoe as are the American people, the democratic system has no way of keeping off to all the jag-off people, it´s crazy to see how inept and stupid people can reach the top with the indulgence of the rest. That involves a huge opportunity cost and corruption spread itself because the circus midgets take advantage and know all forms of lying and robbing that one can devise with nearly impunity. The dwarfs want to sell weapons, to trick savers or whatever necessary to live by other´s sweat no matter the price or sufferings being generated. There is a local idiom which the so called manger journalists do not know well. “To switch on the fan” is when some people or journalists make public and divulge a dossier or release an audio file in favor of sane democratic practices or disclosure any leads related with cases of corruption and dirty play. Just yesterday in one article I refered to trump campaign trail as a woefully disastrous dumpster fire.